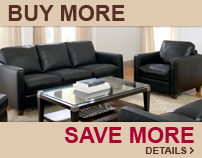 Lazar's Sleeper Sofas offer an incredible combination of custom design, comfort, and quality. Lazar styles are all offered in fabric and in leather, and provide a multitude of options including but not limited to three seat cushion options, three back cushion options, 43 foot options, customizable pillows and customizable piping (on select styles). All Lazar products are offered with a lifetime warranty on the frame and suspension system, and are made of 100% kiln-dried hardwood. Cushion options allows customers to select the best seat to fit their comfort level, and the pitch of Lazar's seats is designed to provide a great balance of comfort and support. Take any Lazar product to our Sleeper Design Center to make the piece perfectly yours! Lazar Sleepers are offered exclusively with Platinum Delivery.